I wonder where that came from. But the Wikipedia article is right, of course, Debord was a vandal, whether he practiced it or not. For example, his movement was the seat of organizations like the Scandinavian Institute of Comparative Vandalism. Moreover, in The Society of the Spectacle, Debord praised “General Ludd”. I used to be a practicing vandal too when a malcontent teenager. And I’m still in favor of creative destruction. I started thinking about vandalism when I researched dérive, which revolves around the “improper use” of certain city quarters, using them for something they were not intended for; and détournement, which is just one step away from vandalism. I was also reminded of the surrealist architectural project Experimental Research into Certain Possibilities of Irrational Embellishment of a City. 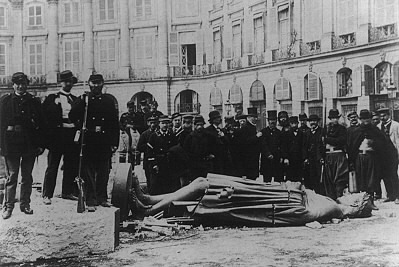 And then the story of Gustave Courbet and the Vendome Column came to mind, “the century’s most radical artistic art,” according to the pamphlet “The Revolution of Modern Art and the Modern Art of Revolution“. But the ‘Vendome Column’ episode was a tragic one for Gustave Courbet, really. This entry was posted in Uncategorized and tagged Gustave Courbet, Guy Debord, Paris Commune, vandalism on July 16, 2014 by jahsonic. I watched all of this film yesterday, sparked by a renewed interest in Guy Debord, who I probably discovered in June 1994 (exactly 20 years ago) via the Wired article by R. U. Sirius on French theory, back in the day when Wired was a cool magazine. The cover of his book Mémoires is made of sandpaper to maximize damage to neighboring books when placed in and out the library shelf. His anti-film Howlings in Favour of de Sade consists of black and white screens (no images) during 52 minutes. His citing of Feuerbach’s The Essence of Christianity. He is the protagonist of the excellent read Lipstick Traces: A Secret History of the 20th Century. He defined the term psychogeography and practiced la dérive and détournement. I also posted two ‘Debord’ photos  on Tumblr. This entry was posted in Uncategorized and tagged counterculture, dérive, détournement, Guy Debord, psychogeography on July 15, 2014 by jahsonic.